Yossi Milo Gallery is pleased to present Soap & Water, an exhibition of black-and-white photographs by David Goldes. The exhibition will open on Friday, April 30 and close on Saturday, June 12 with a reception for the artist on Friday, April 30 from 6:00-8:00 p.m. This exhibition, Goldes' second in the gallery, features new photographic still lifes inspired by two 19th century publications that were aimed at stimulating the scientific minds of children—Michael Faraday's 1861 classic, The Chemical History of the Candle, and C.V. Boys' 1889 Soap Bubbles and the Forces that Mold Them. Using these texts as a starting point, Goldes reenacts and interprets the historical experiments with particular sensitivity to the fragility and ephemerality of the materials involved. His modern versions are constructed from simple everyday household articles such as burning candles, string, soap bubbles, water, and wax paper. 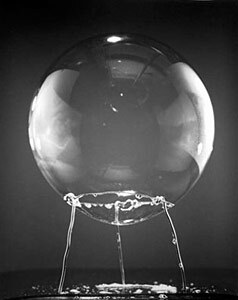 In one picture, a large soap bubble seated on a wire frame, becomes reflective, transparent, stable and monumental. The exhibition also includes Goldes' most recent photographs made from his ongoing explorations of the physical properties of water. Water is variously a site to grow crystals or found to surprisingly not leak from a bowl made of aluminum screening. In another photograph, a paper cup is used to heat water over a candle flame. The cup, normally flammable, is protected by the water which absorbs the heat of the flame. Educated initially in science, David Goldes received a MA in Molecular Genetics from Harvard; he received a MFA from the Visual Studies Workshop/SUNY at Buffalo in Photography. Born in New York in 1947, he now lives and works in Minneapolis, where he is on the faculty of the Minneapolis College of Art and Design. Goldes' work is found in many permanent collections, including the Museum of Modern Art; Whitney Museum of American Art; Art Institute of Chicago; Walker Art Center; Cleveland Museum of Art; Museum of Fine Arts, Houston; Yale University Museum; Bibliotheque Nationale, Paris; and Musée Nicephore Niepce, Chalon–sur-Soane, France. Goldes is the recipient of grants and fellowships from the John Simon Guggenheim Memorial Foundation, National Endowment for the Arts, Bush Foundation, and the McKnight Foundation. In 2002 and 2003, he completed residencies at the MacDowell Art Colony in Peterborough, New Hampshire.